The accountancy profession is going through a massive change as technology and the move to outsourced accounting is enabling firms to provide a better advisory service, control costs better and have a flexible core compliance workforce. The change is inevitable for all firms but managing the change well is of the upmost importance. It is only natural that some staff will be concerned about how the use of an outsourced accounting firm will affect their jobs. 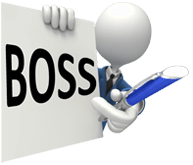 Your staff will always be important as the intermediary between the clients and the BOSS accountants and you will always need them. There may be an odd person who just loves compliance and has no aspirations to grow at all. You may choose to have one or more accountants remain in a pure compliance role. For many accounting staff this is now a great opportunity for them to do more client facing and business advisory work. Having recruited for six years in the accounting market I know this is something a lot of accountants look to achieve in their career because it is more varied and interesting. It is seen as a progression from straight compliance. If you are looking to increase the amount of value-add work that you do, then this is definitely something worth communicating to all your staff. The change is likely to be gradual, so in-house accountants will have the opportunity to adapt. There is an eight step change process that change management guru John Kotter advocates in his book “Leading Change”. A distilled version of this is below. (Note: The size of your firm will dictate just how far you take each step). You need to set the stage and create urgency. Open a conversation about the firm, changes in the accounting industry and what your competition is doing. Identify threats and envisage scenarios about what could happen in the future. Evaluate opportunities that could be exploited. Kotter says for change to be successful 75% of the stakeholders need to buy into change. Creating awareness about the changing times should build the conversation and thus promote the urgency. Step 2: Form a Coalition. You need a team of influencers that will work together that come from different departments. Their influence may come from their position, expertise, natural leadership qualities or political importance. Ask for commitment from these people. Work on team building within your coalition so they support you in your need for change. A clear vision is imperative so people understand why you are making changes. Develop a summary that encapsulates what you see as the company’s future. Create the strategy to execute the vision. Ensure your coalition have the same clarity as you about the summary and vision. Address peoples’ concerns. Understand there may be some resistance and you need to dig deep for problems. I’d recommend asking all staff the open question (in private if necessary): “What concerns do you have about outsourced accounting work?” – Look to illicit all anxieties so that you can handle them. Talk often about the vision and link it to all aspects of operations. Arrange everything ready for outsourcing and at the same time look for any obstacles: processes or reluctant people. Recognize and reward people (praise may be good enough) for making change happen. Help any reluctant staff see what’s needed and why. Adjust internal systems as necessary to facilitate outsourcing. You need some quick wins that your staff can see. This will help negate any critics of your vision. Look for easy projects that can be implemented without too much input from any “negative staff”. E.g. Outsource easy compliance jobs initially to iron out teething problems internally with the minimum of fuss, yet show the concept works. Reward the people who fulfil the goals. Small projects are just a stepping stone. So scale up as soon as you can but still commit to the level of care required to ensure success. Analyse what is going right and what is going wrong for each project. Set goals to continue building momentum. Make sure the positive changes are recognized. Ensure your coalition are still supportive of the changes. Talk about progress as much as possible. Ensure new hires understand your firm’s changes and benefits. Publicly recognize key members for their contribution. Plan for the long-term, ongoing roll-out.